While brushing regularly (i.e., two times a day) is important, it’s how you brush that matters the most. 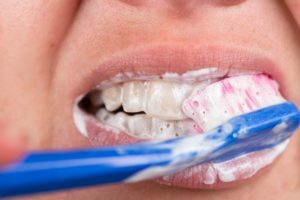 Using the proper brushing technique ensures that you reach every nook and cranny of your mouth possible without hurting or damaging your teeth and gums. For a refresher on the proper brushing technique, continue reading below. Using gentle pressure, move the brush back and forth in tooth-wide strokes. Clean the inside surfaces of the front teeth by tilting the brush vertically and moving it up-and-down. For optimal oral health, brush your teeth for two minutes, two times a day using a soft-bristled toothbrush. Replace your toothbrush every three to four months, or sooner if the bristles have worn out. Use a toothbrush and toothpaste that has the ADA seal of acceptance. It is also recommended that you brush your tongue using a tongue scraper (that has the ADA seal of acceptance). Break off about 18 to 24 inches of floss and wind most of it around your middle fingers. Hold the floss tightly in place using your thumbs. Guide the floss in between two teeth and curve it around one tooth in a C shape. Gently slide the floss up and down, and back and forth. Repeat this method on the rest of your teeth, including the back side of your back teeth. Good oral hygiene at home should be paired with regular checkups with your dentist. Both children and adults should see their dentist every six months to get their teeth and gums professionally cleaned and examined. To get more oral health tips, or to schedule a dental appointment for you or your family, please contact Cobblestone Park Dentistry by calling (405) 603-8520 or emailing us today.